Of the random memories I have from my teenage years, I can clearly picture sitting in a friend's kitchen while he cooked macaroni & cheese. When it was done, he and a pal took a taste and began discussing what spices it needed, ultimately ending up shaking in a dose of nutmeg (a spice that, at the time, I hadn't a clue about). Skip ahead to the present day, and, while I enjoy cooking and putting together a meal, I'm not one of those people that looks at random ingredients and knows which flavors will go with what or takes a bite of something and can say, "Oh, this just needs a touch of..."
No, that's not me. I'm someone who finds what I like and I stick to it. I'll possibly alter the cooking process a tiny bit if I think that I just might have an idea or something to add, but 95% of the time I keep things rather simple. And that's just how I like it. Therefore, when I was told that Flatout recently partnered with Hungry Girl to launch their new Flatout Hungry Girl Foldit Flatbread, I was intrigued... yet hesitant. Could such a simple change take my favorite sandwich to the next level with ease? A delicious and fun alternative to sliced sandwich breads, these tasty flatbreads are low in carbs, a good source of fiber and taste great? 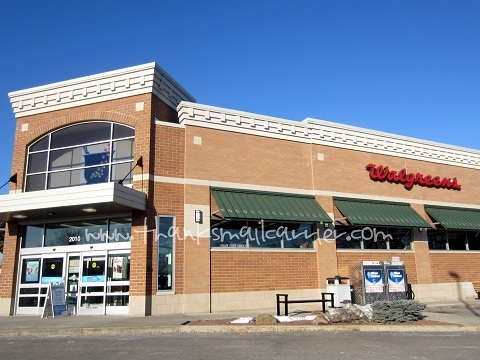 No one had to tell me twice, I was ready to head to my local Walgreens to find Hungry Girl Foldit Flatbreads and try them out for myself! 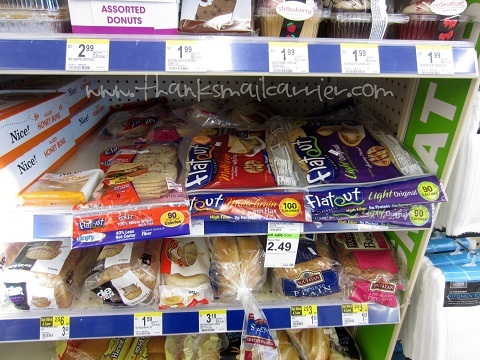 While my Walgreens doesn't have a huge grocery section, I was still excited to find a few different varieties of Flatout Flatbread right on the shelf. After going back and forth between the Traditional White, 100% Whole Wheat, and Rosemary & Olive Oil options, I finally opted for the latter and was eager to head home to put together a few sandwiches to see what my family would think. Considering that there isn't really a chance that I'm going to reinvent the wheel when it comes to recipes, I had to start with my favorite basic sandwich, the one that makes my mouth water with happiness every time I put it together: Caprese. 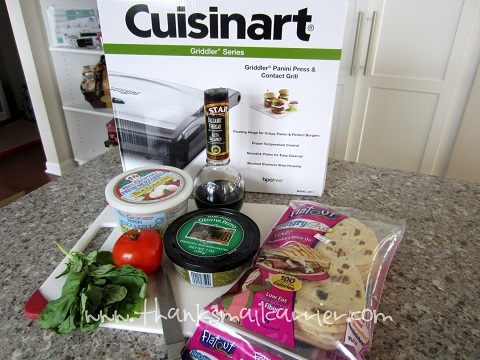 Although my original intentions had been to use my Cuisinart Griddler Panini Press & Compact Grill to toast up this sandwich, the tastiness of the raw ingredients got to me and I ended up eating it cold. Either way though, it's definitely delicious! Spread one or both halves of the flatbread with pesto. I'm a big fan, so I generously spread it on both the top and bottom, but if you're not, just put as much as you prefer so that you still get enough of the flavor. Layer with slices of fresh mozzarella cheese, tomato and basil, drizzle on just the right amount of balsamic vinegar to give it that sweet kick, fold in half, and eat! Completely simple but extremely tasty and satisfying. I love each tasty bite that combines the pesto, mozzarella, tomato, balsamic vinegar and flatbread and I find myself feeling full and satisfied but yet still excited to eat this again and again. Like avocado? Add in a few slices at the end. Maybe you're more adventurous than I am and want to add in red pepper flakes or olive oil. Do it! Not a vegetarian? Throw in some Prosciutto or grilled chicken if you'd like. 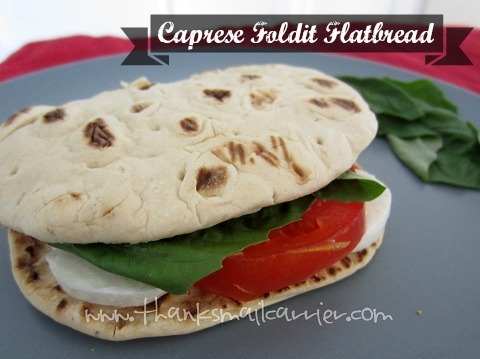 No matter how you customize it, the Caprese Foldit is an update on the delicious classic that is sure to be a hit. At the same time, my husband likes a hot, grilled sandwich to fill him up, so he was happy to pull out his favorite ingredients for a toasted meal of his own. Spread outside of both halves of the flatbread with butter. 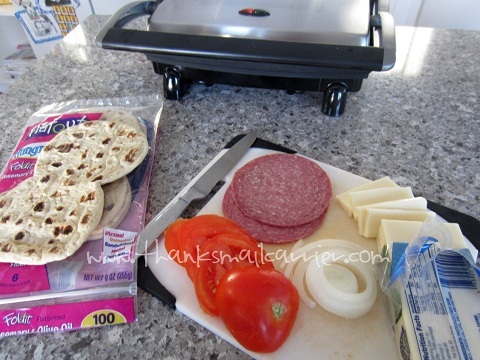 After the panini maker has heated, place the Foldit Flatbread inside and layer with cheese, salami, onion and tomato. 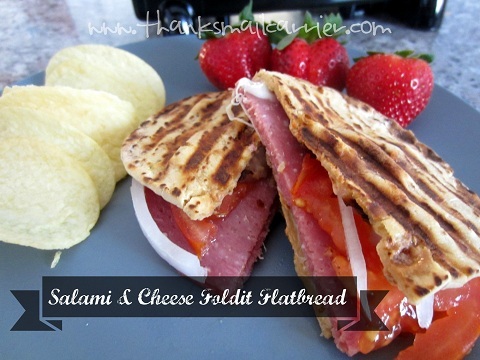 Close the Foldit and panini maker, grill for approximately 1-2 minutes, remove and eat! Around here, some like it hot, some like it cold, but everyone likes Flatout Hungry Girl Foldit Flatbread! I'm a big fan of the way that these are so easy to fold in half to create a sandwich and that they are thick enough to add flavor yet thin enough to not be overpowering. Considering that these are low in carbs, a good source of fiber and come in multiple tasty flavors, I have no doubt that they will be a part of many future sandwiches around here. I'm already excited about the grilled cheese, apple & cinnamon creation that I put together for myself — YUM! Visit FlatoutBread.com to find out more about these and all of Flatout's delicious products, connect with them on Facebook and Twitter, and be sure to keep an eye out for Hungry Girl Foldit Flatbreads the next time you are at Walgreens! Yum! This looks like a great way to fight the packed lunch boredom. I'm thinking of all sorts of yummy combinations to make. I think I'll have one of your caprese sandwiches, please. Looks delicious! That sandwich looks delicious! Thanks for another great lunch option! I have never tried these before they look delicious. This would make a great lunch option. YUM, YUM I have seen these but look forward to trying them! I love that recipe for the Caprisi Foldit (vegetarian Version. I have never purchased flatbread, I usually just get a regular loaf of bread, this should be something new.